It's hard to believe it's been a whole year since we introduced SEO GO... but time flies when you're having fun (and helping people rank better online!) Since the service launched, we've helped hundreds of photographers & small businesses owners build traffic, get more engagement and increase their online bookings & sales. But we wanted to know from a photographer's point of view what working with an SEO partner is really like. 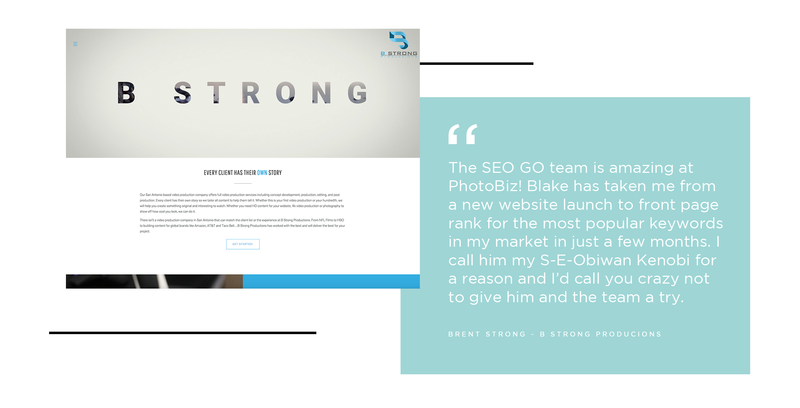 So, we caught up with Brent Strong of B Strong Productions, one of our very first SEO GO subscribers and a fantastic photographer and videographer to boot! Here's the interview, (squashed slightly for length and clarity). PS: Keep reading to save $100 on your own SEO GO service! Brent Strong! Thanks for taking the time to talk about SEO GO! Thank you! Blake is my dude! I call him SEObi-wan Kenobi. (Laughs) Blake is my dude! You’re in San Antonio, and you’re a videographer/photographer. How tough is it to rank in that area? San Antonio can be a difficult market. I was launching a new business and I was wondering how to get a big enough megaphone to shout I was here. But within 3-4 months of working with Blake and the SEO GO team, I was able to get to the front page of Google in 3 of the 4 categories I was focusing on with organic search. It's really amazing! Wow! That's fast, especially in that competitive market. What happened with that was perfect, because I didn't want to turn on the firehose immediately. When the website went live, there were a lot of things I wanted to slow-play and understand. I wanted to be on the front page from the beginning... but how quickly he was able to help me get to the front page was amazing to me. 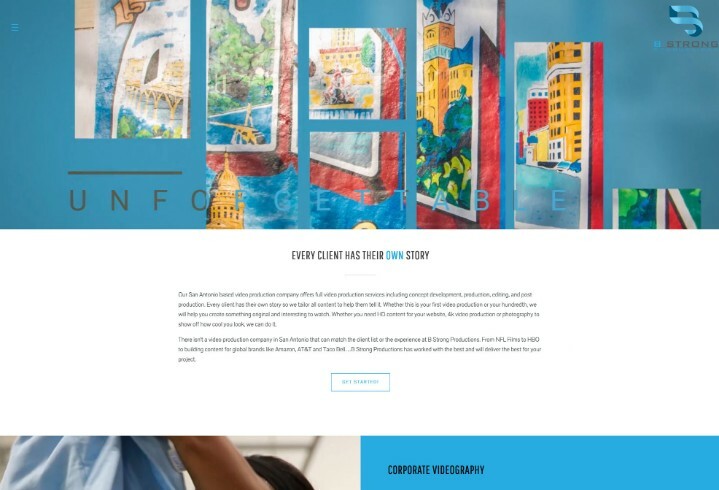 I know we did your website design – was this a brand new site? I had done a rudimentary site that was horrible before, but that's not my business. That's why I went with PhotoBiz. I have to work with people who are passionate about what they do and are good at what they do. If you can't do it to the best, you should hire those that can. So yes, PhotoBiz did the website design, then once that was done I started with SEO. What kinds of tips did the SEO GO team share that got you those results? I would say it's the same way a trainer in a gym can help you lose weight. It's about diet and exercise. It's not a secret! Blake has an incredible amount of knowledge, but it came down to me eating my vegetables – posting on social, linking back to my site, blogging – that eventually got my business in shape. Blake has been a great coach, and there were times I was up to my eyeballs in work and I was still able to do the work to keep me on the front page and keep things moving. It's amazing. Looking at your site traffic, you now have about 10 times more traffic than you did a year ago. Are you seeing more bookings and inquiries, too? Once we started getting traffic, we started figuring out how we are converting and next-level strategy. Like, OK, I'm page 1... now we have to think specifically about what people are seeing and how are we converting. We looked at length of time spent on different areas and how to increase interest in those areas. For example, Blake put a button in the middle of my homepage that increased the number of people reaching out to me significantly. It just said, "Let's Work Together!" But that simple Call to Action made it so easy for all these would-be leads to reach out. Now I'm seeing several inquiries a month, whereas before I knew they were there... but they were just not reaching out. Blake also encouraged me to start business Facebook and Instagram pages. My posting has increased on those platforms, and I realized what I actually had the bandwidth to do as a business owner and solo operator. Because of the frequency of my posting, I hired my first employee to handle Social Media Marketing. That would not have happened if not for Blake's encouragement and showing me the benefits of Social Media and going full-on into a strategy that works. Having been through the service, would you say it was worth it one year later? Yes, and I want to mention something that's the biggest key in my marketing. If photographers and videographers think about it... if you are able to get one more shoot out of this service, it will pay for an entire year or more of SEO GO. $100 each month is so little to ask to be put in front of the audience that you want. To me, it's a no-brainer. If you want to succeed in your photo or video biz, having someone dedicated to the SEO of your website is a no-brainer. You have to have that, and the service pays for itself. I have to give Ashlie major, major props on the design. And the whole PhotoBiz team! As a videographer and photographer, it is really hard for people to understand our industry, what it's like to be a solo operator and have all these different audiences. That we don't just click the shutter button. To have someone on top of our website and feel that partnership – I have never found people who care about my website and understand what it's like more than with PhotoBiz. I feel like they have my back and know what it's like for me as a small business owner, and I am just so grateful. You're Invited To Try SEO GO and Save $100! We are so happy to help clients like Brent Strong find success with their business online! In celebration of the 1-year anniversary of SEO GO, you are invited to give SEO GO a try and save $100! Take a look at photobiz.com/seo to learn more, and sign up to get $100 off here! The deal lis only available for a limited time... so act fast! Register here to save $100 on SEO GO!